Photos copyright of ‘The World of James Herriot’, no reproduction without permission. 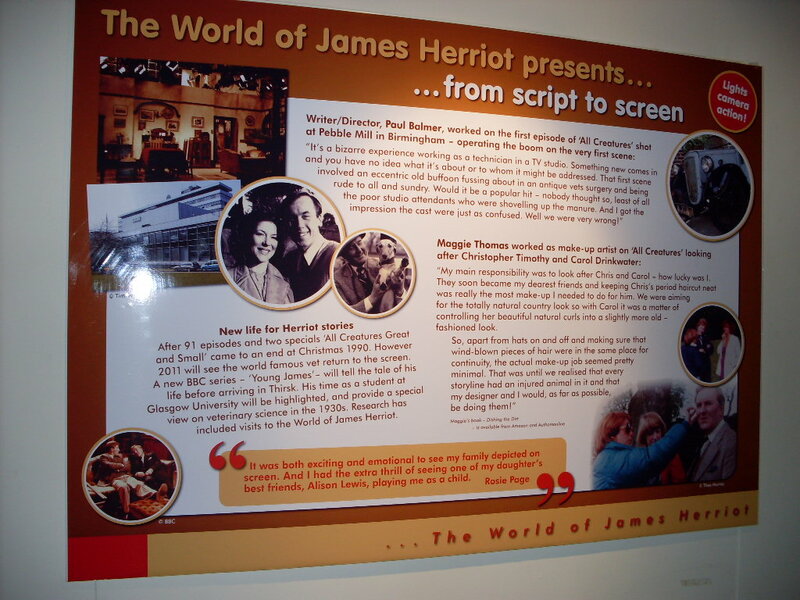 ‘The World of James Herriot’ in Thirsk in North Yorkshire celebrates the life of ‘James Herriot’ (James Alfred Wight). It is currently staging a special exhibition about ‘All Creatures Great and Small’. The series was filmed on location in Askrigg in the Yorkshire Dales, with the interiors recorded in Pebble Mill’s Studio A. Several months ago the organiser of the exhibition asked permission to use some of the ‘All Creatures’ photos posted on this website – which the takers of those photos were happy to agree to. Tim Savage had taken photos of the Studio sets, and Maggie Thomas of the locations. Several people who worked on the series are also quoted in the exhibition, including make-up designer, Maggie Thomas and sound technician, Paul Balmer. The organiser of special exhibition sent me these photos of the display, and you can see Paul and Maggie’s contributions on one of the boards.